I have a finish, finally!! With Thy Needle & Thread "Paper Snowflakes"
I have been knitting a lot lately. I started Wiggle Wrap and I'm loving it! I love the yarn and it's such a fun project. I have pictures on Instagram. Hope you all have a happy, safe and healthy New Year! Oh how sweet! May God richly bless you in this new year! Beautiful! I am working on this one at the moment!! I LOVE this design. You did a great job. Happy New Year! Great finish Nicole! Happy New Year! Beautiful finish! It makes my all tingly inside!!!! I love when you have a blog post!!!!! Happy New Year! What a pretty finish. I think you helped me decide on a future project! Oh, I love it Nicole! I checked out the knitting pattern and it looks like a lot of fun as well. Happy New Year! I love it!!! Happy new Year!! Beautiful finish Nicole! Happy New Year! Happy New Year Nicole. A beautiful finish, congratulations! It's so pretty Nicole!!!!! Congrats on the finish and hope your New Year is happy, happy with lots of finishes :-). It's a lovely finish - congratulations and Happy New Year. Love the finish! Just beautiful! And of course I saw your wiggle wrap. I hope to start my own sometime. Happy New Year! Such a pretty finish! I looked the other day to see if my updater was failing -- good to see your post. That wrap is really pretty, too. Here's to the needle and thread in 2014!! Oh, it is beautiful! What's next on your list to stitch? 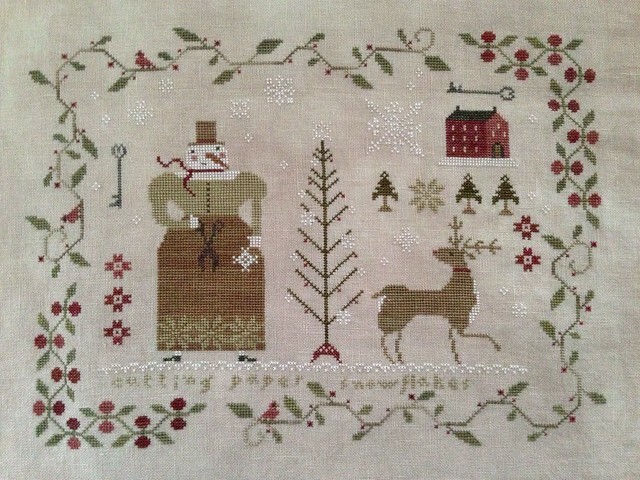 Beautiful stitching and a lovely project.